This chapter discusses efficiency of e-Government services. 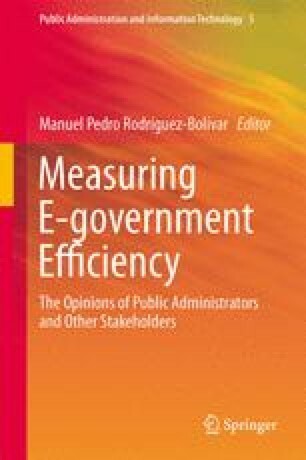 How is it possible to measure efficiency of e-Government services? The key message is that e-Government service efficiency should be assessed both from the user perspective and the administration perspective. Current literature is examined, and a set of indicators is proposed together with a methodology to use these indicators to calculate the efficiency gain of using electronic services, both from citizen/business perspective and administration perspective. Two different approaches are presented. The first approach requires collection of quantitative data from both users and the administration and calculates the efficiency gain. The second (lightweight) approach is less rigorous but still useful to prioritize between different services. The eGovMon project was co-funded by the Research Council of Norway under the VERDIKT program. Project no. : VERDIKT 183392/S10. The author wants to thank the eGovMon core team for valuable input and discussions. Some of the ideas in this chapter were first presented in a workshop titled “Efficient and Effective e-Government” arranged by the European Commission on March 17, 2011.